Supporters of a $15-an-hour minimum wage fear the state legislature could undercut that and block it in Chicago. CITY HALL — Aldermen and activists fear the state General Assembly could raise the minimum wage to $10.10 an hour during its upcoming lame-duck session, and at the same time block efforts to raise it to $15 in Chicago. Aldermen Joe Moreno (1st), Roderick Sawyer (6th) and John Arena (45th) joined in sponsoring a proposed ordinance upping Chicago's minimum wage to $15 an hour for firms making $50 million a year in gross revenues in May. On Tuesday, they issued a statement expressing fears about how the General Assembly could up the state minimum wage to $10.10 during its upcoming lame-duck session, as suggested by outgoing Gov. Pat Quinn, and at the same time take away Chicago's home-rule authority on the issue. Action Now Executive Director Katelyn Johnson accused House Speaker Michael Madigan of siding with Gov.-elect Bruce Rauner and the Illinois Restaurant Association and against the will of the people. Moreno said he'd heard the state legislature was considering the measure and the Illinois Retail Merchants Association and the Chicagoland Chamber of Commerce are lobbying hard for it, but he'd also heard legislators might leave it to Gov.-elect Bruce Rauner to settle when he's inaugurated in January. Regardless, he added, "This was never a part of the deal" in any proposal to lift the minimum wage. "If they try to do something quick down there and try to pre-empt us, we will push loud and hard before the governor signs it" to halt the bill. "That politicians in Springfield waited until after their election to float blocking Chicago's minimum wage increase is disingenuous and destructive," Moreno said. 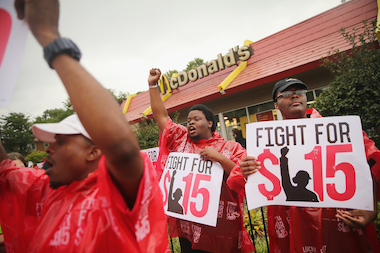 "A minimum wage increase to $15 would generate hundreds of millions in new economic activity. Chicago needs $15 now." Sawyer said Chicago workers shouldn't be limited to the same minimum wage as the rest of the state, not "when Chicago's cost of living is clearly higher." 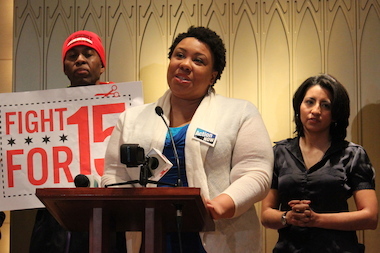 "We urge legislators to abandon any efforts that pre-empt Chicago's home rule so that we can continue to fight for a $15 minimum wage for Chicagoans," Sawyer said. Steve Brown, spokesman for Speaker of the House Michael Madigan, would say only that "the speaker told the media we are surveying House members on the minimum wage and expect that survey to be done this week." Arena pointed to how an advisory referendum in some precincts in the March primary showed 86.3 percent of voters favored a $15 minimum wage. "Springfield legislators shouldn't strip Chicago of our home-rule rights — and they should not strip Chicago voters of their voice," he added. Chicago activists piled on Tuesday. Action Now Executive Director Katelyn Johnson said her organization "wholeheartedly condemns any effort by Speaker of the House Michael Madigan to subvert the will of voters by pre-empting home rule, which would block Chicago from raising its minimum wage. Eliminating home rule is bigger than just the minimum wage. It is about taking away people's right to democratic participation. Our voices are being silenced." Johnson charged Madigan "is siding with big corporate interests like Bruce Rauner and the Illinois Restaurant Association, to make sure that the hardworking people of Illinois get the short end of the stick," adding, "It is time for elected officials to stop working against the very people they are elected to represent." "It's outrageous that elected officials, who are supposed to be representing the interests of working families, are moving to lock hundreds of thousands of Chicago working families into poverty wages," said Amisha Patel, executive director of Grassroots Collaborative. "We insist that Chicago maintain its home rule status, so that we can decide for ourselves what our minimum wage should be." Aldermen said they were calling their local state representatives and senators to lobby against the home-rule restriction in any hike in the state's minimum wage, and Johnson and Patel said they were urging their members to do the same. The thorny issue has been complicated by the federal minimum wage being $7.25 and the state's $8.25. A recent City Council committee meeting saw conflict over rival proposals to raise it to $10, $15 and $13, as suggested by a so-called Working Group handpicked by Mayor Rahm Emanuel. Moreno said the $15-an-hour proponents intend to push the issue for passage in the City Council next month, he hopes before the General Assembly would act on any limitations in home rule on the matter. Will 116-Foot-Tall Old Town Building Clash With Area's Historic Structures? Ask The Parking Ticket Geek: What's the Best Way to Fight a Ticket?